This Mossi door and doorlock have been vetted as being authentic with significant signs of use and age. Mossi doors, like those of the Igbo (from Nigeria), are abstract. 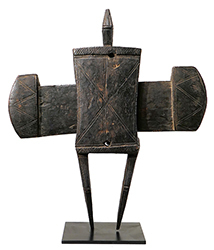 The Mossi have doorlocks similar to the Dogon and Bamana (from Mali), but more massive. Used to protect houses and granaries, Mossi doorlocks are usually abstract. Gravity-fed metal pins drop into holes in the sliding bolt, some of which also have a metal cover for additional strength and resistence to wear. Large locks such as these were afixed with large iron staples through holes to house doors.